Home » About Us » Our Doctors » Richard L. Wixson, M.D. My orthopaedic group, formerly the Northwestern Orthopaedic Institute, LLC, is now part of the NorthShore University Health System Faculty Practice Plan. While the NorthShore hospitals (Evanston, Glenbrook, Highland Park and Skokie) are in the north suburbs, our group will continue to be based in downtown Chicago, at our current office at 680 North Lake Shore Drive, which is adjacent to the Northwestern Medical campus. We will continue to also see patients at our Glenview office. With this affiliation, we will now be able to serve our patients in Chicago and the suburbs at the NorthShore hospitals and Northwestern Memorial Hospital. Over the time I have been on the staff of Northwestern Memorial Hospital (NMH), I have worked out of three different private practice groups. During that period, I have done all of my surgery at NMH, been an active participant in the affairs of the hospital and worked to ensure that the care of my total hip and knee patients there was the highest quality possible. One of our major accomplishments has been the establishment of a dedicated Joint Reconstruction and Implant Service that has served as the basis for an integrated, team approach for providing the highest quality care to our patients. Having developed my career here at Northwestern and helped build our Joint Reconstruction service, my plan is to continue my downtown practice here and continue to use NMH as my primary hospital for total hip and total knee surgery as I have in the past with my different practice arrangements. The affiliation with NorthShore will now also provide the opportunity to care for patients who are part of that system and utilize the NorthShore system. I will continue to see patients largely at the 680 location but will also schedule some office days at our Glenview office location. Going forward, there will also be the opportunity to do some of my surgery at the NorthShore Skokie Hospital. Total joint replacement has emerged as one of the most successful technological advances of modern medicine. In these procedures, painful worn-out joints can be replaced with artificial ones made of metals and plastic. The two most common joints involved are the hip and knee. Since the original development by Sir John Charnley in England in the 1960s, millions of patients have had these procedures. Currently, in the United States, hundreds of thousands of these are done yearly. The most common reason patients may need a joint replacement is from wearing out of the normal cartilage in the joints to the point that there is bone-to-bone contact. This produces reactive changes in the bone, pain and deformity. This is generally known as osteoarthritis. There are many other indications for a joint replacement such as rheumatoid arthritis or fractures that damage the joint. The figures below show arthritic knee and hip joints. When the hip is replaced, the original ball and socket joint is replaced with an artificial one consisting generally of a metal ball attached to a stem which fits inside the hollow canal of the femur or thigh bone. The ball articulates with an artificial socket that is fixed to the cup portion of the pelvis or acetabulum. The cup is fixed to the pelvis by bone ingrowth into a porous surface on the outer metal shell. For the femur, both cement fixation and bone ingrowth methods are equally successful. A bone ingrowth implant is generally used although cement fixation for the femur may be used in older patients whose bone may not be as substantial as when they were younger. The accompanying figures show a titanium femoral stem with a ceramic head with a titanium cup with high strength polyethylene liner and the x-ray appearance. The hip joint consists of a socket in the pelvis called an acetabulum and a ball on top of the femur which is the bone in our thighs. The original hip reconstruction developed in the 1930’s by Dr. Smith-Peterson, was a simple metal cup that covered the top of the worn ball in arthritic hips with a metal surface. Replacement of the knee is best thought of as a resurfacing of the joint. In this operation a metal prosthesis that resembles the normal shape of the femur in the knee joint is placed over the end of the bone. The top of the tibia is replaced with a metal plate with a small stem that reaches down into the bone. The femoral component articulates with a specially shaped polyethylene tibial insert that attaches to the tibial plate. All of these components are inside the joint with preservation of the normal capsule and major stabilizing ligaments on the side of the knees. Generally, the undersurface of the kneecap or patella is also resurfaced with a polyethylene implant as well. These components are fixed with cement or bone ingrowth into porous surfaces. Since most patients have bowed or bent legs before surgery, in addition to attaching the implants to the bones, surgeons use a variety of instruments to make sure that the leg is straight at the end of the operation. A knee that is left bowed or knock-kneed may go on to early failure. Another surgical goal is to have the knee extend completely (straighten out) and bend (flex) as much as possible to allow stair climbing, getting in and out of a car and to be able to sit comfortably. Like the normal knee, it is important that the main ligaments on the side of knee provide stability against the knee moving to the side and being unstable. Total knees have emerged as one the most common orthopaedic operation done and are generally highly successful. The standard total knee in a plastic model and x-rays can be seen in the figures. From the surgeon’s perspective, a knee consists of three compartments. The medial compartment consists of the joint surfaces on the inside side of the knee between condyle at the distal end of the femur and opposite tibial surface. The lateral compartment is between the lateral distal end of the femur on the outside of the knee and the opposite tibial surface. The third compartment is between the knee cap and the front of the end of the femur and is known as the patello-femoral joint. When the first total knee replacements were developed in the 1960’s, the goal was to resurface the worn ends of the condyles on the femur and the opposing surface on the tibia. These are frequently referred to a unicondylar total knee replacement. Prostheses are available to resurface any of the three compartments, although the vast majority are done on the inside or medial compartment. While many of the original implant designs did not survive as long as the full knee replacements, the modern versions unicompartmental knee replacements have shown good survival, have a more “natural” feel to the knee and can be inserted with less invasive techniques. Using these implants successfully has been shown to depend on using them in patients with proper indications. They are usually used in patients with less severe arthritis that is limited to just one compartment. Patients who have evidence of arthritis in the other compartments should have a complete knee replacement since the other compartments will likely continue to degenerate and conversion to a full knee replacement may be required. Heavier patients are worrisome since they place much more force on the knee components, which are supported on smaller areas of bone that the full knee replacement. Lastly, the unicondylar knees are not used in patients who have loss of their anterior cruciate ligament, which is a central stabilizer in the normal knee. In the future, with the use of highly accurate robotic surgery, it may be possible to precisely place these types of components in all three compartments and even more closely replicate the normal knee. The figures show the postoperative x-ray of a partial knee replacement done on both sides. Titanium alloys are used primarily for bone ingrowth in the hip with the femur and cup. It is similar to the metal that is used in military aircraft. In addition to being very compatible with bone, it is a more flexible material. Chrome Cobalt alloys with Molybdenum are a very strong and hard metal. It is used for the total knee replacements and femoral heads in hips in part due to the hard, highly polished and stable surface it provides when moving against the plastic. For some designs, implants that use a metal cup and a metal head were used. These have resulted in complications and an adverse local tissue reaction in some patients. It is an excellent material for moving against the high strength plastic (UHMWPE) but not against another metal surface. Ultra high molecular weight polyethylene (UHMWPE) is the plastic used in the hips and knees. For both the hip and knee, we are now using a cross-linked form of the material that has minimized the wear that can occur between the metal and polyethylene and has excellent strength. The wear of the newest form of polyethylene is nearly that of ceramic bearings. Polymethylmethacrylate (PMMA) is the bone cement used universally to attach artificial joint. This is the same material found in commercial Plexiglas or Lucite. Special vacuum mixing systems we developed at Northwestern are now widely used to create stronger cement at the time of mixing during surgery. Ceramic materials are made of a composite of aluminum oxide and zirconium creating a femoral head with increased strength and smoothness. The ceramics can be used as an alternative bearing surface to the metal on polyethylene in hip replacements and with the potential for minimal wear and increased longevity. It is used in younger, more active patients. A ceramic head with a ceramic up provides the least wear but I now do them rarely due to concerns about “squeaking” of the hip joint in some cases. With the evolution of new technologies and methods, surgeons have developed methods to do their procedures with less invasive techniques and smaller incisions. These methods all fall under the heading of “Minimally Invasive Surgery”. Probably the most dramatic developments have been in General Surgery where procedures such as taking out a gallbladder have gone from a long incision and a week of hospitalization to a procedure done with instruments and endoscopes through multiple small incisions and limited time in the hospital. In total joint replacement, due to the size of the implants we are putting in, some incision is needed. What have evolved are techniques to do this with a smaller incision that minimally disturbs the underlying muscle, capsule and ligaments around the joint. While the outside appearance of a small incision is more appealing than a longer one, the major benefit to patients seems to be the reduced disruption of the underlying tissues around the joint. The goal of these approaches is to reduce the pain after surgery and allow patients to walk and move after surgery easier and more quickly. It is important to be aware that while these advantages apply to the short time around and immediately after surgery, all studies I am aware of have shown that the results of the MIS approaches and the longer conventional approaches are the same within a few weeks to a year. For total hips, there are at least five different kinds of MIS approaches. The one I most frequently use is called a posterior-lateral and is a small incision that begins at the side of the hip and is directed up and toward the back into the buttock area. The advantage over other approaches is that it allows me to see directly where I am working on both the cup in the pelvis and the top of the femur. It can also be used on almost any patient, regardless of size. While the skin portion of the incision may be longer on patients with thicker fat in this area, the deeper part of the incision with the muscles and into the joint is essentially the same for everyone. By using special, angled and offset instruments, I can do the same operation I use to do with the longer incision. In selected patients, new instruments and techniques now also allow us to do the surgery though a small incision on the front of the hip, “direct anterior”, going between the muscles to access the joint. This may allow a faster recovery without restrictions on motion since there is less risk of a hip dislocation. With reduced exposure of the hip, the surgery can take a little longer and there is more concern for fractures. It has also been associated with some nerve injuries and numbness of the front of the thigh. While many surgeons use special tables to pull on and rotate the leg, I use a method that does not require it. For total knees, the traditional incision extended 2-3” above the kneecap to allow the knee cap to be moved out of the way to perform the surgery. With advances in understanding and dedicated instruments, we now generally make a much smaller incision beginning at the top of the knee cap and coming down on the inside of the knee to just below the knee. The smaller exposure makes the operation more difficult and takes longer. There has also been concern that with the limited view of the knee, it may be more difficult to put the implant in as accurately as if there were full exposure. 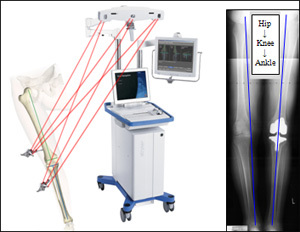 We have addressed this issue by using dedicated minimally invasive surgery (MIS) instruments designed for use with computer assisted navigation to achieve correct alignment and knee prosthesis position at surgery. As in total hips, the purpose of making the smaller incision is to reduce the amount of pain after surgery, have an easier recovery, make it easier to bend the knee and easier to walk again with less support. We have found that the MIS approach works well for patients but must also be combined with a good pain program to achieve these goals. While the smaller incision looks better and may have advantages in the short term recovery, most studies have shown little difference in outcome between it and the longer, more traditional incision. The increased surgical difficulty and time with the smaller incisions, however, seem to be offset by what may be somewhat reduced pain and a slightly easier recovery. Any surgical procedure, no matter how small, requires some sort of incision into the body that will result in some degree of pain. Since total hips and total knees are major surgical procedures where we remove the end of the bones and replace them with metal, plastic and ceramics, there is going to be disruption of the tissues around the joint as well as changes in the bone. Classically, these have been associated with a large amount of pain that requires hospitalization and extensive use of narcotics for pain control. Part of the motivation of the movement to smaller incisions has been the desire to minimally disrupt the tissues around the joints and reduce the pain associated with the surgery. However, the work done on the bones in the joint is the same whether a small incision or large incision is used. At our hospitals, we work closely with the anesthesia pain service to reduce the amount of pain anyone feels after surgery. While pain cannot be eliminated, our goal is to reduce it to a manageable level. We also want to minimize the side effects of narcotic pain medications when include nausea and vomiting, itching, drowsiness and often confusion. For both hips and knees, we have found that a regional anesthesia with a combination of spinal and epidural techniques, when possible, has advantages. With this the lower half of a patient’s body is totally numb and they are sedated so most patients are in a light sleep during the surgery itself. If there are reasons a regional anesthesia cannot be used, such as previous back surgery or bleeding issues, we use a traditional general anesthesia with the same results. A big advantage of the epidural is that we can use it for pain relief after the surgery and continue that overnight. If a general anesthesia is used, post-operatively we use a PCA (Patient Controlled Analgesia) where the patient can give themselves additional pain medication as they need it. All medications have side effects, which for the narcotics are nausea, itching, sleepiness and sometimes confusion. To help control post-operative nausea, we start patients on anti-nausea medications in the operating room and continue them after the surgery. If patients can take it, we have also found that the use of a non-narcotic pain reliever, such as Celebrex, reduce the pain as well. Since total knees hurt more than total hips, we also generally begin the total knee patients on more pain medication after surgery to provide a baseline of pain relief. A major advance in pain control has come from having our anesthesia regional pain service temporarily block the nerves that go down to the knee. This is done by giving a local anesthesia with a temporary catheter, like an IV, to block the pain in the nerves coming from the knee for several days after the surgery. These are referred to as regional anesthesia where we can block the femoral and sciatic nerves. This is similar to what a dentist does for blocking the pain during dental work. By using all of these methods, we have found that patients need less overall narcotics and are much more comfortable. Most patients find themselves taking only oral pain medications while in the hospital and when they go home. In total hip and knee replacement, accurate and reproducible placement of the artificial implants is important for both short term success and long term outcomes. To assist this, we have been using computer assisted navigation to help place the implants accurately in both hip and knee procedures. In order to do this special computer trackers are temporarily attached to the bones around the joint with small, removable pins during the procedure. These computer trackers monitor the position of the bone and instruments by sending infrared light signals to a camera and computer system. The computer software then provides images and measurements the surgeon can use to perform the operation more accurately. In the future, these techniques will be used as the basis for robotic surgery. By obtaining an MRI of the knee prior to surgery, the ideal placement of the knee components can be determined and special cutting jigs made for each patient’s individual anatomy in patients with mild deformity. This is similar to what is accomplished with the computer assisted techniques and does not require the extra pins, navigation equipment and planning done at surgery. These are referred to as shape matched or patient specific cutting blocks. For patients with significant deformity, the computer assisted technique seems to help me more in balancing the ligaments and getting the knee to go completely straight. With technology and innovation, there are many new developments in total joint replacement. Most of these are based on years of research and testing after which they are tested in clinical trials in patients. Once a new device or procedure has been shown to be safe, effective and approved by the FDA, it can be used in clinical practice. At that time, most surgeons will choose to use a device based on what they see as the benefits and from review of studies presented at national meetings and published in the professional journals. These studies are very important since they are all reviewed by other surgeons and scientists for validity. Once this information is available, then a surgeon may choose to use a new procedure or implant if it offers advantages or addresses a problem with current designs. If the conventional procedures and implants work well and give reliable, reproducible results, it is often wiser to continue with them. There is always a concern that a new technique, no matter how well thought out and tested, may have problems that are not apparent for many years after they have been used. With the trend for direct advertising of new technologies and implants by pharmaceutical companies and orthopaedic manufacturers, many patients now are aware of these emerging technologies and wonder if they are suitable for them. Frequently, there are now news reports and stories that feature a particular surgeon with a newest, latest technique. While these are useful in bringing new methods to everyone’s attention, a news show does not have the time for the detailed scrutiny that occurs when new methods are presented to a scientific meeting or journal. A tremendous amount of information is available on the internet about any implant, orthopaedic manufacturer, surgeon or hospital. With all of this information, I have tried to address some of the more frequently asked questions. This is an older operation where a cut is made in the bone below the knee and the lower bone is shifted to a different angle to take the weight off the arthritic part of the knee and move it over to outside of the knee where cartilage is still normal. While this was a revolutionary improvement when it was developed many years ago, the procedure has a high incidence of complications, does not relieve pain as well as a total knee and frequently requires conversion to a total knee in 5-10 years. While I did many of these in my early years in practice, I now limit it to very young and very active patients. These are small metal devices that are designed to fit into the worn compartment of an arthritic knee and fill the space that was lost as the cartilage and bone were worn down. I do not use or recommend these devices due to concerns about the underlying biologic and mechanical responses of bone moving against metal. In addition, the scientific reports on these have found an unacceptably high incidence of complications, continuing pain and the need for further surgery. There is a tremendous interest in being able to place smaller implants into the worn areas of knees and preserve more the normal ligaments, such as we do with uni-compartmental replacements. The ultimate goal of doing this would be to restore a knee to a more “natural” state. While there are a number of systems now available that are being tried, I am unaware of evidence that they have a high enough, reproducible success rate to warrant using them now. Our hope is that these types of implants can be proven to work reliable and be able to be implanted with the next generation of technology. There was great hope a number of years ago that we would be able to treat arthritic knees and hips by growing new bone and cartilage instead of replacing them with metal and plastic. While cartilage cells can be grown and put back into the body, their use is still in the early developmental stage and limited to small isolated lesions in the cartilage. From my review of the literature and the material presented at scientific meetings, it seems we are a decade or more away from being able to treat arthritic hips and knees with regrown cartilage and bone. For the foreseeable future, artificial implants are the best choice. The early stages of osteoarthritis involve breakdown of the surface layers of cartilage and progression of the process where the cells inside the cartilage die and cannot produce the material needed to sustain the cartilage. Eventually this results in all of the cartilage being worn away down to bone at which point it becomes painful to the point that a total joint is often required. These drugs are very similar to the naturally occurring lubricants we have in our normal joints. Multiple injections of Hyaluronic acid may slow or delay the arthritic process and can provide some temporary relief from pain. However, the results are not completely predictable and are not lasting. They also do not seem to be effective if there is complete loss of the cartilage and the bones are rubbing together. At this time, I am not aware of any definitive studies demonstrating long term effectiveness. However, for some patients with mild to moderate arthritis, they may provide good temporary relief. They, unfortunately, will not cure the arthritis and ultimately most patients’ joints continue to deteriorate. The traditional arthritis drugs, known collectively as NSAID’s (Non-Steroidal Anti-Inflammatory Drug), include aspirin, ibuprofen (Advil, Motrin), naproxen (Aleve, Naprosyn), diclofenac and a number of others. While they do provide pain relief for mild arthritis symptoms they are associated with gastro-intestinal disturbances, bleeding, kidney damage and all the other issues listed on the package inserts. Drugs such as celecoxib (Celebrex) and meloxicam (Mobic) are COX-2 arthritis drugs that have a lower incidence of side effects, especially gastro-intestinal and effects on bleeding. While perhaps not as effective as the original NSAIDs, they can also good relief for many patients. Since they do provide relief too many patients and most patients do not have any of these side effects, they are still a worthwhile treatment for mild to moderate arthritis, as long as they are taken under the supervision of an internist or family doctor. Because of the potential side effects, anyone taking either the standard NSAID medications or COX-2 medications needs to be checked regularly. Since our orthopaedic office is not equipped to draw blood and we are not accustomed to managing medical problems, I prefer that patients receive this from their primary physicians. For many patients with mild to moderate arthritis, the use of these medications along with exercise and strengthening can significantly reduce the pain and symptoms. Glucosamine and Chondroitin have emerged as alternatives to standard arthritis drugs and may provide some relief of arthritic symptoms. Because they are a food (originally available primarily in Health Food Stores) they are not regulated and controlled as a drug by the FDA. The goal is to provide some relief of pain and perhaps delay of progression of the arthritis. Since they have minimal side effects, these compounds may be useful to patients with mild to moderate arthritis. Again, unfortunately, there are no studies I am aware of demonstrating a reversal of the arthritis. Once the bone is exposed in the joint, they do not seem to be as beneficial. All total knees, whether complete or partial, have a metal femoral component that is similar in shape to the bone at the end of the femur of thigh bone that forms the top half of the knee joint. The bottom of the knee joint is formed by the top of the tibia or leg bone. This is replaced by a shaped plastic insert, usually supported by a metal base plate. In most knee designs, the plastic insert is fixed to the metal base plate and does not move. In mobile bearing knees, both the partial knee (unicompartmental) and full knees (tricompartmental), the plastic insert can also move on the base plate creating two mobile surfaces. The advantages of this are that the plastic piece can be shaped so there is less stress on the material and potentially increase motion. The disadvantage is that there is another moving part that can break or be separated in the joint. The current designs of the static, non-mobile, total knees perform very well with little evidence of progressive wear. My judgment at this time is that there does not seem to be a reason to change to the mobile bearing design. Other excellent surgeons, who I respect, have found them very useful. Further improvements in the outcome of knees may be more dependent on surgical technique and improved instruments for putting the knee in. Modern manufacturing methods can produce precisely machined and polished metal balls for the femoral head and metal sockets for the cup or acetabulum. The concern has been that the even the very minute wear that occurs releases metal ions into the body that can accumulate over time. There are now reports that some patients may develop local inflammatory and allergic reactions with the metal-metal hips. This can be a very severe problem resulting in destruction of the bone and soft tissues around the hip. If it occurs, the hip needs to be revised with another surgery. The FDA has now recalled the one type of metal-on-metal hip, the ASR made by DePuy. We are now seeing some of the same types of reactions in modular hips where the stem and neck are separate pieces. Because of this, I have stopped using modular hip stems. Does Dr. Wixson do the surgery? The answer is that Dr. Wixson does all of his cases himself rather than supervising a student or resident to do the work. Northwestern Memorial Hospital (NMH), where I do the bulk of my surgery, is the primary teaching hospital of the Northwestern University Feinberg School of Medicine. My position there is a Professor of Orthopaedic Surgery where I am in private practice and am one of the “Part-time Faculty” of the medical school rather than a member of the full time faculty medical practice group, NMFF. Throughout my career at NMH, I have enjoyed and profited from my interaction with the residents and students, nearly on a daily basis. With our current program, I no longer work directly with the residents and they are not involved in the routine care of my patients. During the actual surgery, my primary help comes from my Physician’s Assistant, Anne Johnson, PA. The majority of the implants I use are manufactured by Stryker Orthopaedics, part of Stryker Corporation. This evolved over the years as Stryker acquired a number of orthopaedic companies, Osteonics and Howmedica, and merged the best elements of those companies with their own. Much of their orthopaedic implant business was originally developed by Howmedica, whose products I had used for many years. With the use of their implants, I had been involved with research and development of new instruments and techniques for implanting them. With the acquisition of Howmedica and the introduction of computer assisted surgery with navigation by Stryker, I have continued my developmental work with them. This involves working with the engineers and designers and providing the surgeon's perspective on new approaches and methods. In addition to consulting with them, I also frequently give talks and instruct other surgeons in the use of these products and methods. All of this takes time away from my practice and being able to be in the operating room. To compensate for this time and work, Stryker pays me for my extra time as a consultant in my work with them. This is a beneficial relationship where I am aware of and have access to newer technologies and Stryker has the input of a practicing orthopaedic surgeon. For years, I have been following the appropriate guidelines and disclosing this relationship to the hospital, the university and my professional societies as well as all of my patients. While I primarily use Stryker products, I am free to select whatever implant I feel is best for my patient and use implants from the other orthopaedic manufacturers where they offer advantages. In addition, I have developed over the years a number of small surgical instruments and patient positioners that are manufactured and sold by Innomed. I receive some royalties from the sale of these products. Early in my career, working with the late Dr. Eugene Lautenschlager in the Biomaterials Department of the former Northwestern University Dental School, we developed a number of devices for mixing and preparing bone cement for total joint replacements. Since the work was done in the University laboratory facilities, this was patented through Northwestern University, which receives royalty payments from the manufacturer, Stryker Corporation. Both Dr. Lautenschlager and I have received a portion of these royalties for many years as part of our employment agreement with Northwestern University. Once the decision is made to go ahead with surgery, our office will work with you to get ready for surgery. Pre-operative therapy. For both hips and knees, a program of strengthening, stretching and mobilization of the arthritic joint before surgery can help relieve symptoms and prepare you for the surgery and recovery. Pre-operative medical evaluation will vary, depending on your situation from contacting and working with your primary medical doctor to our arranging for a thorough medical evaluation. Our office will do insurance authorization and pre-certification. It is also a good idea for you to check with your insurance carrier to be sure you are complying with the multiple and varying requirements that may be present. Pre-operative teaching class. In preparation for your surgery, a teaching class at the hospital provides valuable information. It covers what to expect, the time in the hospital and plans after discharge. Participation by the specialty nurses, physical therapists, occupational therapists and a discharge planner is very helpful. Anesthesia. There are two types of anesthesia that can be used: A “General” anesthesia (completely asleep with a breathing tube and ventilation) or a “Regional” anesthesia (spinal or epidural anesthesia that numbs the lower part of your body where you are awake or partially awake and breathing on your own). Although each has advantages and disadvantages, the outcomes of both techniques are the same. With the benefits of an organized Anesthesia Regional Pain service and the ability to use it post-operatively for pain relief, we prefer a regional method when possible. Pre-operative testing. Usually all of these activities are scheduled on a single day a where baseline tests, electrocardiograms and chest X-rays are done. More complex testing such as CT imaging for prosthesis planning or cardiac stress tests are scheduled separately. Blood Donation. On the basis of our experience and previous studies, many patients with uncomplicated, primary knees may not need to donate any blood pre-operatively. Patients having hip or bilateral knee procedures or revision surgery will generally donate two units of blood prior to surgery. Although not always required, many patients prefer to donate their own blood for in case they need a transfusion. In total knee replacement, the incision is slightly curved over the front of the knee toward the inside. Almost all of the surgeries are done now with smaller incisions using minimally invasive methods. By moving the patella or kneecap to the side, the knee joint is exposed for resurfacing. When a partial knee replacement (unicondylar) is used, a slightly smaller incision that only exposes the front of the knee is possible. Along with improved total knee designs, much of the success of the modern operation has been attributed to improved instruments that allow accurate placement of the prosthesis and restoration of normal leg alignment and motion. In order to optimize our results at surgery, I use instruments with a computer assisted knee navigation system or with custom shaped blocks based on an MRI using the same principles. When the computer is used in surgery, I place small pins with tracking devices in bones around the knee. The computer displays the position of the implants and alignment of the leg during the surgery. This avoids the need for placing long rods inside the bone, which is used with conventional manual surgery as a guide to where to make the cuts. Following placement of the knee replacement and checking that the knee is straight and has full motion and good stability, the wound is closed. A limited skin incision on the side and back of the hip is used to approach the hip. In a patient with a normal build, we have found a single, minimal incision, 3” to 6” in length, allows us to perform the surgery and directly visualize the placement of the prostheses. Heavier patients may require a longer skin incision but still benefit from the minimal disruption of the underlying muscles and tendons with this technique. Other patients may be candidates for anterior approach, from the front and side of the hip, which goes between the muscles to get to the hip joint. Once the joint is exposed, the arthritic head of the femur (ball) is removed. Instruments are used to shape the acetabulum (cup) of the pelvis to fit the new prosthetic cup that is inserted. The top of the thighbone or femur is then prepared to accept the metal stem. A ball is attached to the top of the new femoral stem that is placed into the new socket of the cup creating the new joint. Modifications of this over the years with special attention to repair of the ligaments and capsule that hold the joint together have resulted in minimal risks of dislocation. The fixation achieved at surgery is secure enough that most patients can begin full weight bearing immediately as tolerated in the recovery phase. Computer assisted systems to make the placement of the implants more accurate are also used. This also involves temporarily, in surgery, placing small pins in the pelvic bone above the hip. Prior to coming into the hospital, my office staff, Jennifer Lawrence, R.N., Anne Johnson, P.A. or Amanda Priebe, and the hospital staff will give you detailed instructions about the time and other preparations for surgery. Patients come into the hospital generally about one and one-half hours before the scheduled time of the surgery. I, along with the anesthesiologist and house staff, will meet with you and your family in the pre-operative area. There are many activities here including quadruple checking to be sure that we are operating on the correct side. Once everything is checked, we go back to the operating room. Following the procedure, the patients are generally kept in the recovery room for approximately two hours. Family members generally go to the surgical waiting room where I meet with them after the surgery. After this, family members can meet the patient up on the orthopaedic floor and stay with them as long as desired. Once on the floor, the nurses monitor the patients, provide the pain medication through the epidural catheter that had been used for anesthesia or PCA (Patient Controlled Analgesia) devices, and keep them as comfortable as possible. Through the use of protocols we have established with our pain service, we attempt to individualize the amount and frequency of pain medication for each patient. For total knee patients, we frequently use a newer approach where the anesthesiologists place a small catheter just next to the femoral nerve at the top of the thigh. Most of the sensation in the front of the knee comes through this nerve. For the first several days after surgery, a dilute local anesthetic is given through this to help block the pain, make it easier to move the knee and decrease the need for narcotics. Another injection is done by the regional pain anesthesiologists in the back of the thigh to number the sciatic nerve and block the pain in the back of the knee. This is similar to how a dentist would give a local injection to block the pain from dental work. While this is effective in reducing the pain after surgery, it also results in a marked weakening of the thigh muscle needed to walk. Patients cannot put full weight on the leg or walk unsupported while the nerve block is in place without a risk of falling, which could result in an injury or broken bone. The benefit is a marked reduction in pain after surgery and earlier return of motion. The average hospitalization lasts between two and three days. Most patients are able to get up the day of or the day after surgery with the help of the therapists. For total hip patients, the emphasis is learning to walk with crutches or a walker, beginning muscle rehabilitation and learning how to function without risking a hip dislocation. Most hip patients are ready for discharge on the second day after surgery. For total knee patients, an additional emphasis is placed on regaining knee motion after surgery with physical therapy and active stretching exercises. A great deal of bending of the knee can occur with simply letting the leg hang down and dangle or pull it back. Based on our experience and the published literature, we did not find that the use of a continuous passive motion machine (CPM) was helpful and stopped using them after surgery. Our therapy goals for discharge home or to the rehabilitation facility are for everyone to have good pain control, be independent in transferring in and out of bed, out of a chair; off and on a toilet, dressing and other self care activities. Most patients require only oral pain medication by the end of the hospitalization. Our teaching class covers these activities in detail. Following the initial recovery in the hospital, patients can either go home or spend more time recovering in a rehabilitation hospital. Patients most suitable for going home are those that usually have had surgery on a single joint and have someone else available to help them when they are first at home. Patients with multiple joints, such as bilateral knees, or a complex surgery often need the additional therapy provided in the rehabilitation facility. While we have sent patients to the Rehabilitation Institute of Chicago near Northwestern for many years, most insurance companies and Medicare will only cover this very high level of care in patients with multiple problems. As an alternative, we now are able to send many patients to a local rehabilitation facility closer to home. Many of these choices are now dictated by the type of health insurance you have. The hospital discharge planner will help you determine which is the best and easiest for you and your family. Once you are discharged from either the rehabilitation hospital or directly home from NMH, we arrange home health care with visiting nurses and physical therapists that come into the home to continue the therapy program initiated in the hospital. Once you have left the hospital, our office keeps in contact with you and the home health agency about your progress. The first post-operative visit is approximately one month after discharge where we take an x-ray and check on the progress of your recovery. Generally, we advance your activities and therapy at that time. Unless there issues that need to be addressed, I then see patients one year after surgery and every several years thereafter. It is very important that patients return for these later follow-ups since any problems with loosening or wear can be detected much earlier with an x-ray. The goal of the surgery is to restore function and relieve pain. The outcome we strive for, and usually attain, is to give patients a strong, stable, pain free joint that will allow them to participate in normal activities of daily life. With current technologies, these joints have the potential to last for twenty years or more. Although total joint replacement procedures are among some of the most successful of any type of surgery, it is still major surgery with the potential for significant complications or failure of the operation. While no one likes to think about a bad outcome, we have found that being aware of the potential problems and actively trying to prevent them has been the best approach. Some of the many potential problems that can occur are discussed below. With a general anesthesia there can be problems with reactions to the medications or the breathing tube used by the anesthesiologists. With the regional type of anesthesia, either a spinal or an epidural, there can be injury to the spinal nerves or cord with possible permanent injury or paralysis. With an experienced anesthesia team a major complication or death from the anesthesia is extremely unlikely to occur. These issues and risks can be discussed with the anesthesiologists during the pre-operative assessment. Almost anything that can go wrong with the human body can occur during or after surgery. Medical problems from heart attacks to constipation have been associated with most surgical procedures, including total joint replacement. Some of these may be more likely from the stress of the surgery while others may be related to the medications that are needed. The most serious problems are ones that threaten life such as a heart attack or a stroke. Others, such as urinary tract infections can be relatively minor. The best way to prevent medical problems associated with a total joint replacement is to be sure that you are as healthy as you can be before surgery. While we do routine screening tests before surgery, many patients benefit significantly from also being seen by a primary care physician for a thorough evaluation before surgery. If a medical problem such as heart disease is found pre-operatively, the surgery is elective and can always be deferred until the heart is taken care of. One of the most worrisome complications immediately following a total hip or knee is a blood clot, called a deep vein thrombosis, forming in the large veins in the leg, which may break loose and travel to the lung. A large blood clot in the lung, a pulmonary embolus, can cause blockage of blood flow to the lung, causing a pulmonary infarction that could be fatal. Without prevention, there is a high incidence of blood clots forming in the legs after total hip and knee replacements. A small percentage of these can go on to cause a pulmonary embolus. With prevention, these risks can be greatly minimized. On our joint service, we use both mechanical pumps and medications to prevent this. After surgery, patients are fitted with compression boots that continually pump the blood out of the legs. All patients are put on blood thinners, usually a pill (Coumadin or warfarin) and daily injections (Fragmin, a low molecular weight heparin). An anticoagulation dosing service run by the hospital pharmacists controls the dosage for a month after the surgery by checking the amount of blood thinning several times a week. After this, the risk of further blood clots is quite low and the medication is stopped. Perhaps the most devastating complication in any type of total joint replacement is infection. Since the prostheses are large foreign materials, they are more susceptible to infection than living tissues. Infections, though quite rare, can occur immediately after surgery and even many years later if bacteria get into the blood stream. If an infection occurs, it usually requires the complete removal of the total joint. In most circumstances, the infection can be treated with antibiotics once the implants have been removed. After a period of time, we can usually put a new joint back in with another surgery. The successful measures we use to prevent infection at the time of surgery include 1) sanitizing the operating rooms, which have positive pressure with clean, ultra-filtered air coming in through the ceiling, 2) body exhaust suits worn by the surgical team, and 3) the use of antibiotics in the period around surgery. Post-operatively we recommend immediate treatment of any major infection with antibiotics and routine antibiotic prophylaxis with dental procedures. Any change in the shape or configuration of a bone can weaken it, usually temporarily. Very uncommonly, either during insertion of a prosthesis into the bone or in the post-operative period, a fracture occurs. Our surgical techniques are designed to minimize this from happening. If there is a fracture, usually they can be successfully treated either operatively or without further surgery. One of the most common post-operative problems is a dislocated total hip where the ball can come out of the socket. My surgical technique specifically tries to prevent this through careful attention to the proper positioning of the components and by preservation and repair of the capsule around the joint. Regardless of how well the surgery is done, the hip can be dislocated by the same maneuver we use in surgery. For this reason it is very important that for the first four to six weeks after surgery, while healing is occurring, a position of flexing the hip past a right angle or turning the knee inward be avoided. If a dislocation occurs, it can usually be reduced or put back into the socket without further surgery. However, if it becomes a recurrent problem, surgical repair may be needed. It is best to follow the precautions and avoid a dislocation in the first place. By contrast, dislocations are uncommon following total knee replacement. Both the knee and hip have major arteries and nerves immediately adjacent to the joint. Since we know where they are, great care is taken to prevent any inadvertent injury. However, particularly in revision surgery or where there has been previous trauma, the anatomy may be distorted with a greater likelihood of problems. Even with everything being done appropriately, there can be a remote risk of injury resulting in such problems as foot drop. Primarily with hips, one of the major concerns has to do with ending up with two legs that are the same length. Frequently, patients either have one leg shorter than another due to arthritis or an apparent sense of the shortening due to a contracture that draws the leg up. In surgery, I use a variety of indirect measurements to end up with the correct length. Occasionally this can be off a little bit or it may be necessary to slightly lengthen the leg to achieve adequate stability (usually no more than 1/8” or 3/16”). Lengthening in total knees is rarely seen except in cases of severe deformity where the normal length of the ligaments has been altered. As part of our bodies’ healing mechanism, any injury to bone can be perceived as a fracture, which may stimulate the formation of more bone in attempt to heal the injury. With the work done on the bone during routine total hip and knee replacements, in a small percentage of individuals, bone can form around the joint, usually in hip surgery, causing stiffness and loss of motion. Very rarely, this could even result in the bones being fused together. While the vast majority of patients do not need to worry about this, any patient who has a history of extra bone formation or whose x-ray has signs suggesting that this may happen, I may recommend treatment with either prophylactic medications (Indocin) or a small dose of radiation a few days after surgery. The primary goal of total hip and knee replacements is to relieve the pain of arthritis. While these continue to be some of the most successful and reproducible surgeries, a few patients may either continue to have pain or develop pain around the joint. This is usually associated with soft tissue scarring and can usually be improved with further physical therapy. Pre-operatively, most patients have some degree of limp that almost always disappears after completion of physical therapy. Occasionally, there may be a persistent limp due to habit, continued weak muscles, one or the other leg being shorter or persistent discomfort. One of the major problems with an arthritic hip or knee is the accompanying loss of motion and contractures that accompany the disease. Following total joint replacement, most patients will experience a significant increase in their motion with little resulting functional limitations. In some patients, however, there may be some persistent loss of motion. In total knees, the biggest concern is in obtaining adequate flexion or bending. If too much scar tissue forms too early before motion is obtained, it may even be necessary to manipulate or bend the knee under an anesthesthetic to get adequate motion. To help avoid this we emphasize early, aggressive therapy, and good pain control to allow physical therapy. Although this is less of an issue with a total hip replacement, there may be some patients who do not regain adequate motion despite intensive physical therapy. For the prostheses designed for fixation with bone ingrowth into the porous metal it is essential, for long term success, that new bone forms and attaches to the metal prostheses. While modern designs are fitted to obtain the secure fixation required for this, failure of the bone to attach to the prosthesis could result in late loosening and increased pain. With our current designs and methods this now occurs very rarely. One of the biggest problems in the early years of total joint replacement was that the prostheses could become loose and require repeat surgery. With current designs, based on published reports, it is uncommon for early loosening to occur. If there is loosening of any of the total joint components from the bone, this often becomes painful and requires revision surgery. In a total hip, the motion of the joint occurs between the head of the femoral prosthesis, usually a round metal ball, and the cup that is usually made of a very strong form of polyethylene. In total knees, the motion occurs between the metal femoral condyles and a polyethylene tibial surface. One of the biggest problems in older types of total joint replacements has been wear of the plastic with the generation of very small particles. In some patients, this has caused a reaction in the body resulting in resorption of bone around the implants (lysis). This is currently the leading cause of revision surgery at many centers. The current implants we now use have newer forms of the polyethylene specifically made to resist this type of wear through a process of cross-linking the polymer chains. In younger, very active patients the new technologies of either all metal or all ceramic joints have been developed to minimize this problem since they have little or negligible wear. However, like any other new technology, there are certain to be unforeseen problems and issues in the future. The biggest concern with metal bearings involves the potential for accumulation of metal ions in the patient’s body and the development of an immune reaction requiring revision. While modern ceramics are very strong, the initial European experience resulted in breakage of some of the components. These unknown risks may be outweighed by the potential benefit of the joint possibly lasting indefinitely. Fortunately, although this can happen, this problem has been virtually eliminated with modern metallurgy and the use of appropriate materials. Although this is a long list of potential complications and problems, it is important to realize that these occur uncommonly. By having an organized total joint service and practices in place, we have attempted to minimize their incidence. The vast majority of patients does very well and has no problems. However, any major surgery is associated with many potential risks and complications. Consequently, I only recommend it when there is no other way to restore a patient’s function and relieve their pain. If you have read this far, you can see that modern total joint replacement enjoys much of its success to all of the above issues having been addressed. Since this is far too much information for anyone to absorb during an office visit, I put this monograph together as an aid to having patients understand my approach and what I can offer them. Coming into the office with this understanding has been very helpful for most patients. With this as the background, we can then spend the time during an office visit addressing specific questions and issues.